Results to Monday 24th Sept. The Torbay Triathlon for all ages from 8-99. this festival of triathlon featured both junior races and adult races with distances to suit. This totally traffic-free triathlon is an ideal event for all levels. A pool based swim, followed by a bike leg on the smooth surface of the Velopark and finishing with a parkland run. 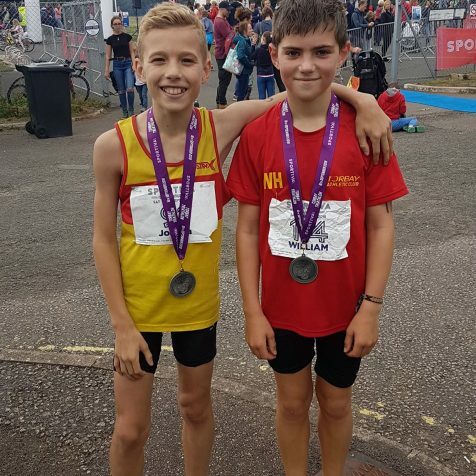 Showing great strength and determination several Torbay AC juniors took on the challenge of the Torbay triathlon. In her second triathlon Emma Harrison was 2nd female Tristar 3 (37:53) while first timer Josie Ratcliff took 3rd race (39:43) – (300m swim/7.5km cycle/2.5km run). Meanwhile in her first triathlon Mia Ratcliff took fifth place in female Tristar 2 (31:57) and Josh Taylor was 6th male (29:05) (200m swim, 6km cycle, 1.9km run) Amy Harrison was 4th in tri kids ages 8-10. (13:22) and did particularly well on her bike! The kids loved it! very well organised , great opportunity to take part in a multi discipline event.